Click here to answer some simple questions and we’ll suggest an ideal program for you. Pilates is simply resistance training. We use springs and bodyweight exercises to develop a strong core and condition the whole body. I’ve done Pilates before. Do I need to take Beginner class? Absolutely. 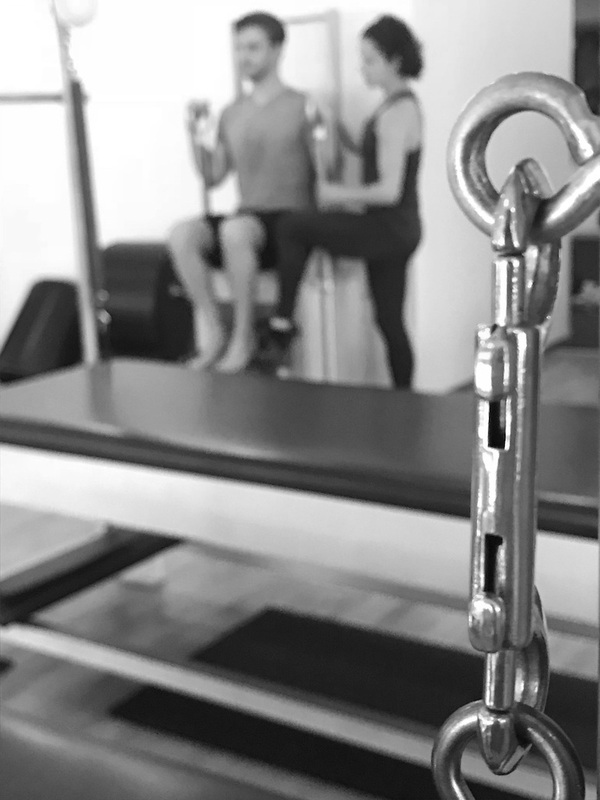 Private sessions and beginner classes are the foundation of your Pilates practice. Our group classes employ the unique Pilates equipment, and we need to show you how to use it! So many classes! How do I know what’s what? You will find descriptions of each of our classes by hovering over the class type on the schedule page. In a nutshell, our classes are limited to 10 or less, and you will always use the spring driven equipment. Expect a lot of hands on and personal attention. Comfortable athletic wear, free of buttons, snaps, and zippers. The studio is co-ed so please dress accordingly. Baggy shorts should be avoided as we incorporate inversions and straddle stretches in our workouts. We do not require that you wear socks in our studios, in fact some exercises require no socks to avoid slipping. If you do elect to wear socks, sticky bottom socks are your best bet. If you do not own sticky socks we have them for purchase at our studios. Send a friend! Your sessions are always transferable, and you can give away or sell your spot to avoid a cancellation penalty. The front desk will always try to fill last minute cancellations but short notice makes it difficult. Class adjustments are often made on short notice - as such the studio does not notify class attendees of instructor changes. Please check your schedule regularly for any last minute changes. Yes! Our staff is trained in Prenatal fitness. Moms-to-be can choose between Private and/or Semi Private Sessions. Just ask!